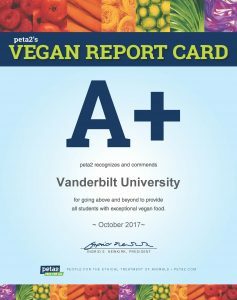 Peta2’s Vegan Report Card A+ for Vanderbilt University. Over the past four years, vegan eating has exploded in popularity on college campuses nationwide—and this year is no different. Since 2013, the number of schools that received an A grade has more than tripled, and the number of schools that received a B has more than quintupled! We assess completed questionnaires and dining hall menus of thousands of colleges and universities across the country and then grade the schools so that you can see how your current or prospective one stacks up.